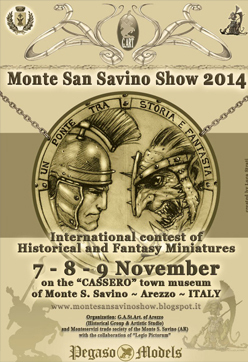 Monte San Savino Show in Italy! We are so much looking forward to celebrate the miniature hobby love there with everyone who will be there! Monte is always like a big family meeting and it seems the family grows every year. We are looking forward to see many new faces to the event this year! We also have Andy, Oli's dad with us and many more friends are expected to be there! Do not expect a live report as we are really enjoying our time there, with great italian miniature friends, great italian food and wine and hopefully great tuscany november autumn weather! See you there and read you afterwards! There are 0 Kommentare for To Monte! !